Differentiating each diamond defines their value and price. This Guide to Selling Diamonds is an explanation of key factors diamond buyers consider to formulate an offer for a diamond. Much of the information in the guide is common knowledge among diamond dealers and based on our opinion and years of experience in buying and selling diamonds. If your diamond is not certified or is only appraised, you should consider sending it to a diamond grading laboratory to maximize the diamond’s selling price. The two most common gem laboratories are Gemological Institute of America and European Gemological Laboratory reports. The differences in the labs are briefly explained below. Be aware that not all labs that certify diamonds are the same or hold the same grading standards. The Gemological Institute of America (GIA) is the leading diamond grading laboratory used in both the retail and wholesale diamond market. GIA has laboratories worldwide and its system to grade diamonds is held in the highest regard by professionals in the diamond business. Those who claim other laboratories are the same are not up to date on the differences and grading standards of various gem labs. GIA is considered the best diamond laboratory in the world in terms of their color and clarity grades. The best way to sell a diamond is to start by having it certified with GIA. If you have a quality diamond, a GIA report may help you get more money for your diamond. Certification will not calculate a price for the diamond but will list the quality and proportions which is the basis for calculating the value of a diamond. Diamonds graded by GIA will regularly yield a higher cash offer for your diamond than diamonds without a GIA report. EGL is another lab that is commonly used in the diamond and colored gem business. There is EGL USA (LA and New York) and EGL International laboratories. Even though they use the same name, these gem labs are not affiliated with one another. EGL reports from international locations are usually more inconsistent than EGL reports out of the locations within the USA. No EGL diamond gem lab report will hold the same status as a GIA certified diamond grading report. Despite this, EGL reports still have some value in terms of identifying the quality and value of a diamond. It is rare but, from our experience, we have purchased some EGL diamonds that were accurately graded. As a “rule of thumb” in the diamond business and in our opinion, EGL reports, regardless of laboratory’s location, are not as accurate as a GIA report. Both EGL labs have been known for assigning very loose or liberal grades when compared to GIA’s strict diamond grading standards. EGL often comes with an appraisal which states values that far exceeds any jewelry appraisal or retail priced diamond. These inflated appraisals that accompany the diamond lab report should not be relied upon when trying to re-sale the diamond. This is not the best way to calculate your diamond’s selling price. In reality, it is probably the worst way to figure out the selling price for a diamond. What sellers need to understand is that GIA and EGL are not equal, even when their reports state the same information. If you have a 6.0 ct H VVS2 Round Brilliant with a GIA report and a 6.0 ct H VVS2 Round Brilliant with an EGL report, the GIA diamond will sell for significantly more money. The reason is simple: EGL is probably a few grades lower in color and clarity according to a GIA standard. If your diamond is uncertified or appraised, you should consider a reputable laboratory for certifying your diamond. However having it certified by EGL will probably not get you the best price for your diamond. The AGS lab is not as well known as GIA or EGL, but is known throughout the diamond business. AGS is considered a strict grader of diamonds by some in the diamond business. However, AGS is similar to our experience with EGL. In our opinion, AGS is not as consistent or strict in grading color and clarity as GIA. The AGS cut grading system however, is probably the one aspect of their reports that is superior to most other laboratories. But this is a matter of debate. AGS’s standards for grading Cut are somewhat different than GIA’s cut grade system. But if AGS says you have a Very Good, Excellent, or Ideal Cut diamond, you have a nicely cut diamond. When comparing an AGS report with the same grading as a GIA report, it is likely the AGS report will assign a higher color and clarity grade than GIA. Unfortunately to a diamond buyer, this just means the diamond is over-graded and will not pay more for your diamond just because the AGS report assigned a higher grade than GIA. For example, what AGS may call a “D” color may come back lower with “E” color from GIA. We have seen this regularly and have purchased many diamonds with lab reports from both labs on the same stone. Invariably GIA assigns a lower stricter grade, especially when it comes to the color grade. There is no reason to doubt the quality of your diamond and guess if the grading is accurate. You should send your diamond to GIA and have confidence the grading will be honored by a diamond buyer. Even a diamond that has been graded by GIA or other lab must be evaluated to ensure the diamond is still in the same condition as of the date of the report. Many used or recycled diamonds have been worn since the certification date and may have incurred some form of damage. Even though diamonds are the hardest substance known to man, they can still be damaged, chipped, and nicked. Minor damage to diamonds can often equal a major loss in value. 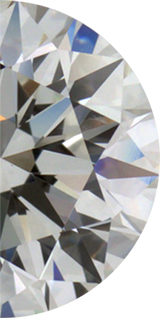 Polished diamonds have many facets and are prone to being damaged when worn daily. Minor chipping, nicks, abrasions and bruises are all common damage to diamonds that are worn regularly in jewelry. Bruising a diamond often occurs to the top of the diamonds (crown of diamond) from the bench jeweler setting a ring’s prongs with too much pressure. Chipping and nicks are common damage to the girdle or edge of a diamond. Diamond rings can sit up above the finger, making them prone to striking them on any object. With enough force, chipping will occur along a facet lines or on the point on fancy shaped diamond. Although it is not common to “scratch” a diamond, abrasions can occur from normal wear and tear. Diamond buyers regularly buy diamonds with old reports, but all diamond buyers need to be sure the diamond is in the same condition as when certified in order to make an accurate offer. Minor damage can greatly impair a diamond’s value. If diamond weighs on even number, such as 5.0 ct diamond, then it is on a “magic number” (also see discussion below under carat weight). A nick or chip could take the diamond’s carat weight to 4.99 ct and into a lower price bracket which will change the cash offer for your diamond. This is another reason it is important to have your diamond “loose” so it can be thoroughly evaluated for any wear marks or damage. If the diamond has any damage it may be a candidate for re-cutting or re-polishing. If the damage is minor and the diamond’s carat weight is well above the “magic number,” it might be corrected with little weight loss or loss in value. For example, a diamond weighing 2.39 ct with chips on the girdle (edge of diamond) may be able to be recut and stay above 2.0 ct so it does not fall below the 2.0 ct “magic number”. This is crucial so the diamond stays within the price bracket for the 2.0 to 2.99 carat price ranges. Falling to the 1.5 to 1.99 ct price bracket will significantly lower the price the diamond that was once above 2.00 carats. Diamonds graded as Flawless are often taken out of this grade when set in a ring or worn. Any minor blemish or bruise can take a Flawless (FL) or Internally Flawless (IF) diamond down to VVS1 or VVS2 which reduces its price per carat. Visit The Marketability of a Diamond and see how a diamond’s value is assessed, thus making it marketable or not marketable!